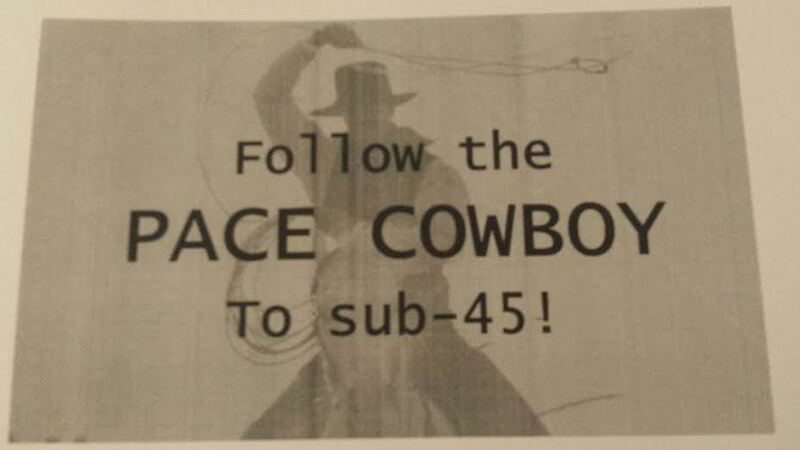 Two cowboy things happened after the recent post about Greg, the pace cowboy. Ladies and Gentleman! 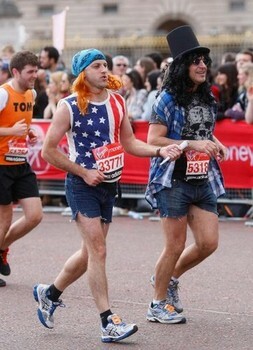 I want to introduce you to Greg, the first pacer we have seen IN JEANS! 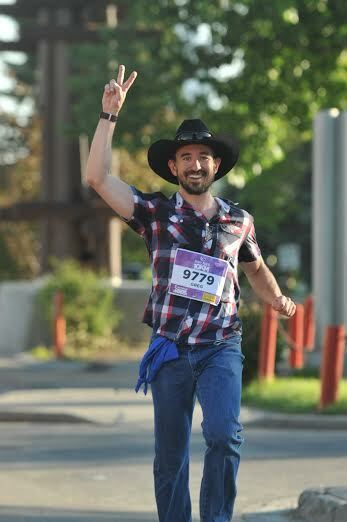 He paced the Calgary Marathon 10K on May 31st. 1. What gave you the idea of running dressed as a cowboy/in jeans? 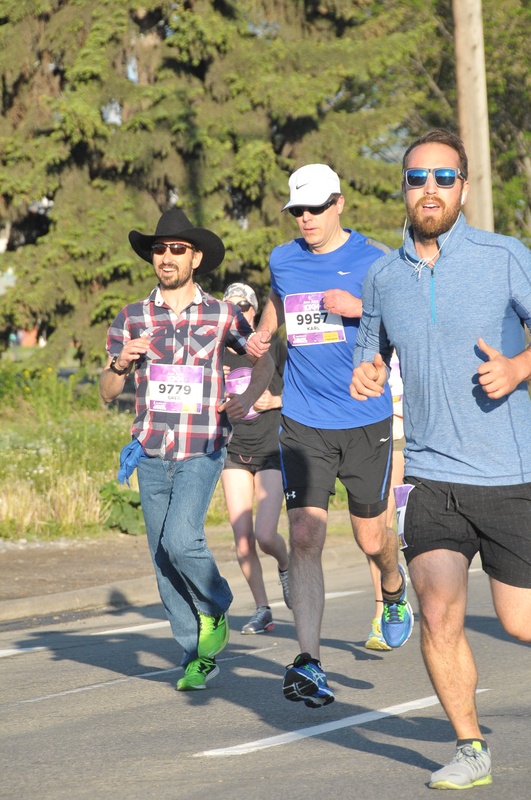 Earlier in the spring, I hurt my Achilles tendon so I wasn’t racing; my coach’s orders in fact were to skip the Calgary 10k race. Of course I told her I wouldn’t “race”….which to me meant I had to find another reason to run it as I didn’t want to miss out on the day’s festivities. I had the idea of doing a Western look, especially since it’s Calgary, Alberta, Canada. I did a trial run 24 hours before just to make sure the outfit was “runnable” and heard a few honking horns as people saw me running along the pathways in jeans and a hat. 2. What were some of the questions/comments from spectators and runners? 3. How bad was the chafing? There was ZERO chafing. The biggest issue I found was that the jeans and shirt held in the moisture and felt a little heavy towards the end and the felt cowboy hat held in moisture like crazy! 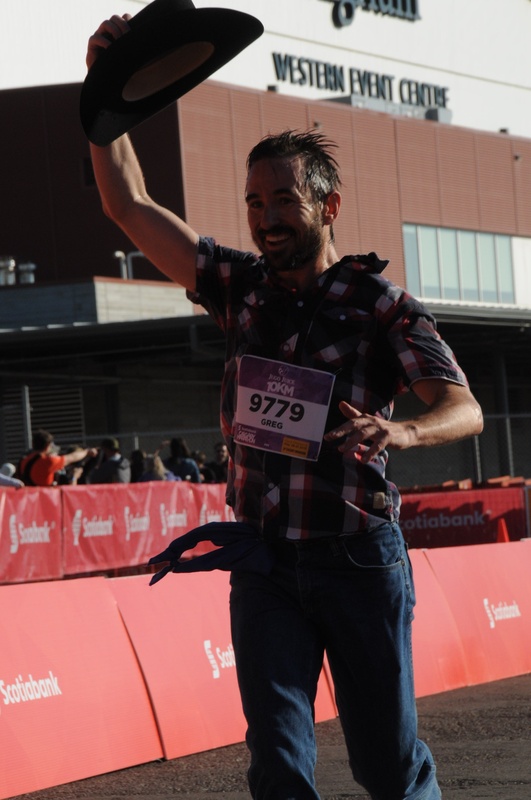 Here is a picture of me near the finish line, note the sweat on my head as the hat held it all in! 4. 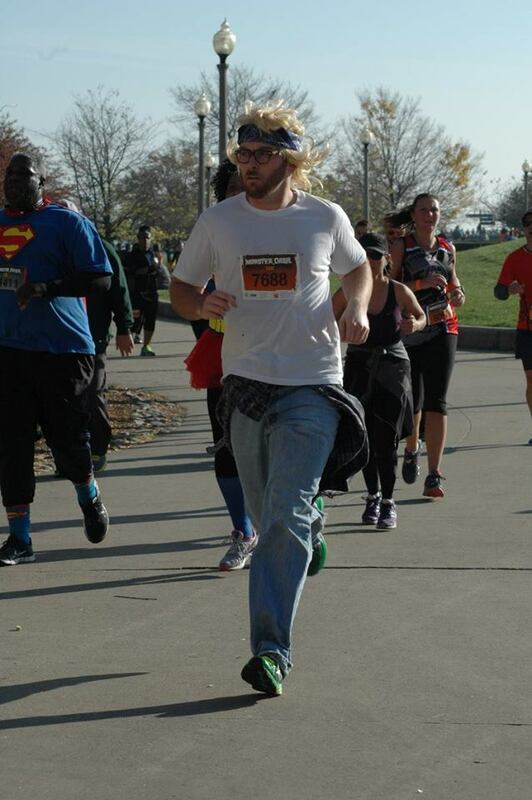 Any advice for others who want to be as awesome as you and give running in jeans a try? When it comes to giving advice for running in jeans, I think the two big things are: 1) Make sure they’re a comfortable pair of jeans – I couldn’t imagine running in skinny jeans or something that cut off circulation and 2) Take a test run to get a good feel – learn how they flex, how they might feel heavier after a few miles, and what to expect when you do a race in your jeans. 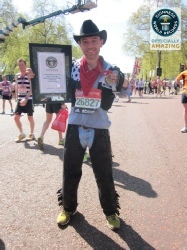 Knowing what I know now, I’ve actually thought about taking down that “Cowboy Marathon” record that was set at the London Marathon (3:09) as I’m pretty sure I could do that, jeans, hat and all! Like I said, go ahead and give it a whirl, but there is no way you can love him as much as I do. See the full collection of denim-inspired costumes here. 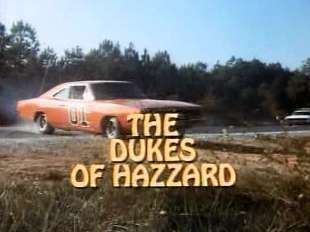 There is nothing on this earth that brings me a childhood comfort like the television show Dukes of Hazzard. [SCREEECH]. Back up. “Uh, what?” you ask. “Jill, you are pathetic” you say. Let me explain. Television in my childhood was a treat. My sister and I would wait all week for Friday night. My dad would either make popcorn – old-school style in a pot on the stovetop – or we would take a ride to Hills and buy it beforehand. [The popcorn at the Hills Snackbar was delicious. Was Hills just a Pittsburgh thing?] Sitting on the floor in front of the television, that was carried from my parent’s bedroom into the living room, with big bowls of popcorn on our laps watching the handsome Duke Boys, pretty Daisy, and being naive to the contentiousness of the confederate flag: nothing better. First, there is the creative and amazing Andy who ran as this, this, and this in the past. 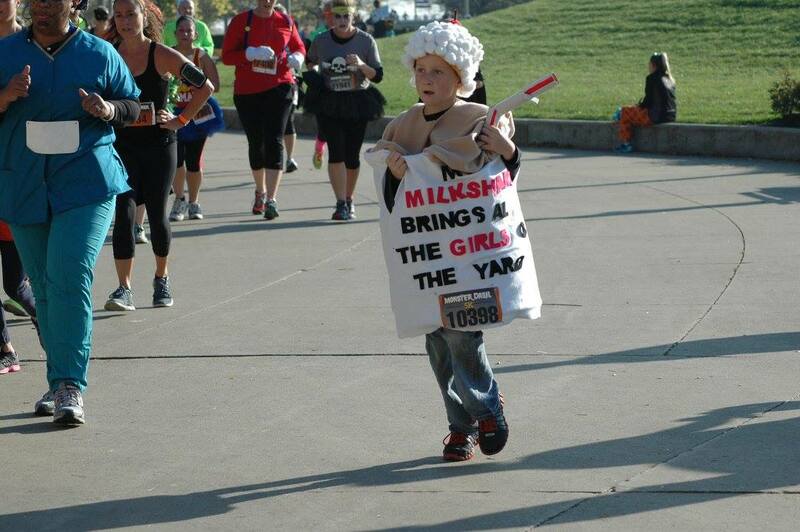 He sent me a picture from his most recent race. Notice the jorts. So. Much. Love. Again, jeans and jorts. Love. Love. Love. 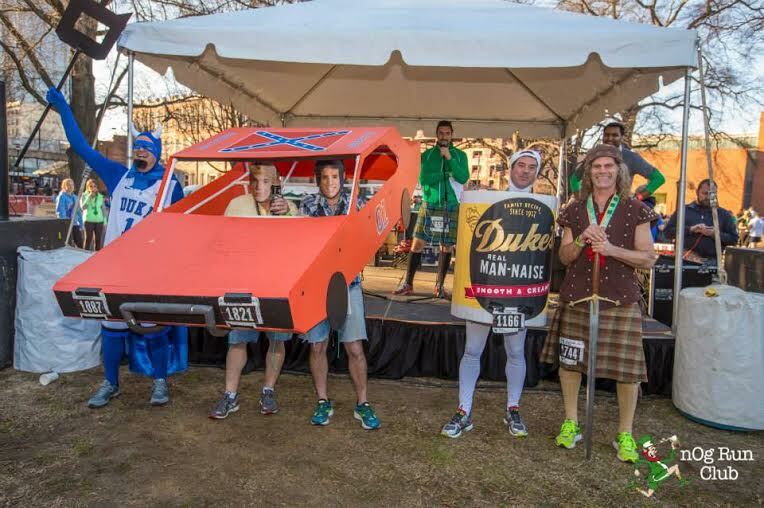 I can only hope that the microphone and speaker in Luke’s hand is so he can yell “Yeeee Ha!” as he ran. People are so creative. That is all. 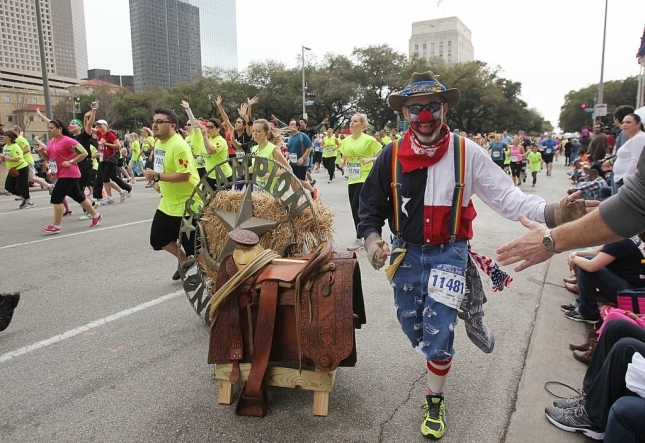 Click here for the entire collection of denim running costumes. We continue this week with more race costumes that involve denim. Kids, here is your lesson for the day. 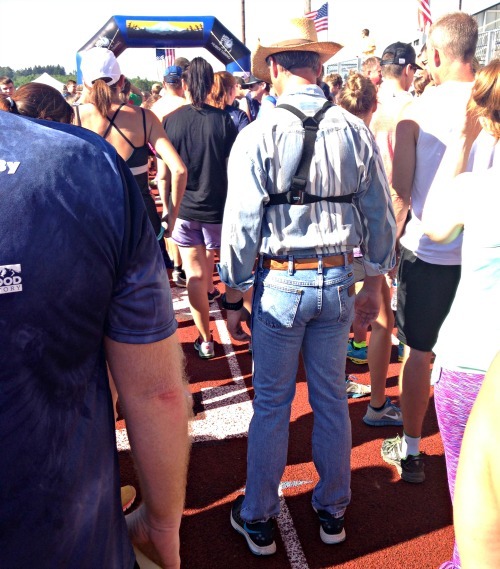 Click here for the entire collection of denim running costumes. Love them as much as I do. 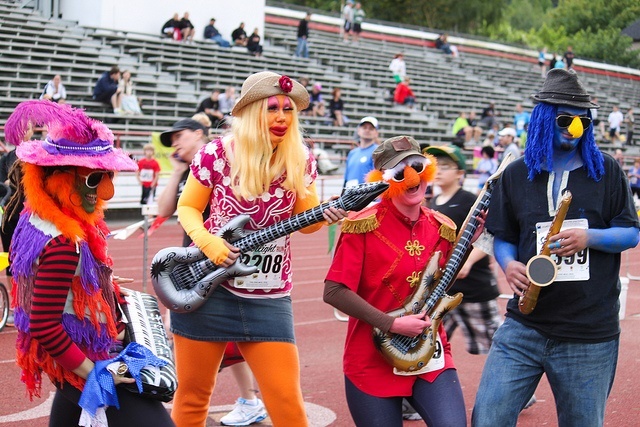 I have said it before: there is no better way to try out jogging in jeans than to run in a denim-inspired costume for your next race. Fortunately for you, I have amassed a large collection of possibilities. Do it. Make it your resolution for 2015. Take pictures and send them to me. I am a fan of Chicago and could easily rattle off the 87 reasons why I like it there. But since I know you really don’t care, I will save you needless scrolling and get right to the new reason that was added to my list. 87. 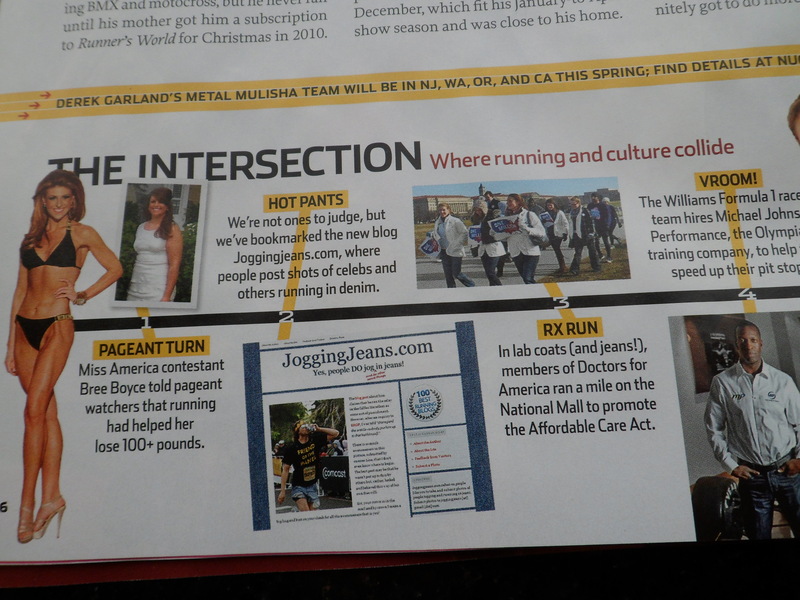 Chicagoans, when given the chance, will run in denim. 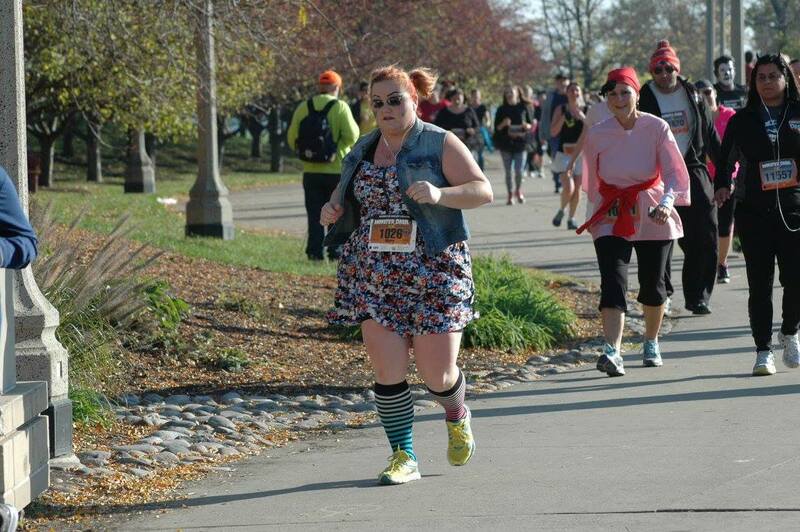 Evidence is in last month’s Chicago Monster Dash.